James Christopher "Jimmy" Armfield, CBE, DL (born 21 September 1935 in Denton, Lancashire) is an English former professional football player and manager who currently works as a football pundit for BBC Radio Five Live. He played the whole of his Football League career at Blackpool, usually at right back. Between 1954 and 1971 he played 627 games in all competitions, scored six goals, and spent a decade as the club's captain. He also represented the England national team 43 times between 1959 and 1966, and captained them in 15 games. He was a member of England's 1966 World Cup-winning squad. After retiring from playing, Armfield managed Bolton Wanderers and Leeds United. After Armfield's family moved to Blackpool from Denton, he was spotted in a practice match at Bloomfield Road by Tangerines manager Joe Smith. Armfield, who played on the left wing for that game, scored all of Blackpool's goals in a 4–1 victory. Impressed, Smith offered him a trial. On 27 December 1954, Armfield made his Blackpool debut at Portsmouth. Armfield recalled of the game: "That League debut at Fratton Park was not, I fear, a very conspicuous one for me. I found myself up against Gordon Dale, a very clever and strong winger with plenty of experience. He was far too good and we lost 3–0. Gordon really gave me the run-around, and I realised just how much I had to learn. They were a very good team in those days, and they scored a goal in about the first two minutes — and I hadn't touched the ball. We were three down after fifteen minutes." He was part of the Blackpool side that finished in what is to date still the club's highest-ever League position when they finished as First Division (then the top flight in England) runners-up in the 1955–56 season. Armfield was voted Young Player of the Year in 1959. In 1966, he narrowly lost out to Bobby Charlton for the Footballer of the Year award and had to content himself with being Blackpool's Player of the Year. The Seasiders achieved little success in his seventeen years with them, the club having won the FA Cup the year prior to his arrival. The exception was promotion to the First Division in 1969–70. Armfield was awarded a testimonial match, played on 2 September 1970, his 35th birthday, and thousands turned out to pay tribute to him. He played his final game for Blackpool on 1 May 1971, in front of a crowd of over 30,000 against Manchester United at Bloomfield Road, in what would be the last game played by Blackpool in the top flight of English football for almost 40 years. He came back from a ten-game injury lay-off to make his swan song appearance. Armfield was inducted into the Hall of Fame at Bloomfield Road, when it was officially opened by him in April 2006. Organised by the Blackpool Supporters Association, Blackpool fans around the world voted on their all-time heroes. Five players from each decade are inducted; Armfield is in the 1960s. Armfield won 43 caps for England between 1959 and 1966, and captained his country on fifteen occasions. He made his international debut on 13 May 1959, against Brazil in front of over 120,000 fans at the Estádio do Maracanã. He played in the 1962 World Cup in Chile, where he was acclaimed as "the best right-back in the world". He was also voted "best right-back in Europe" between 1962 and 1964. However, a groin injury suffered in Blackpool's last match of the 1963–64 season, against Ipswich Town ruled him out of the side for England's busy summer programme. Fulham's George Cohen took the opportunity to establish himself as England's first choice right-back with a series of strong performances, and Armfield was unable to force his way back into the team. He played two further matches in the warm-up to the 1966 World Cup and was included in the winning squad but a toe injury sustained in the pre-tournament appearance against Finland and Cohen's incumbency ensured he played no part in the tournament. His appearance against Finland was his last for his country. In the 1966 World Cup final only the 11 players on the pitch at the end of the 4–2 win over West Germany received medals. Following a Football Association-led campaign to persuade FIFA to award medals to all the winners' squad members, Armfield was presented with his medal by Gordon Brown at a ceremony at 10 Downing Street on 10 June 2009. Not long after hanging up his boots, Armfield became manager of Bolton Wanderers in 1971, leading them to promotion to the Second Division in the 1972–73 season as Third Division champions. On 4 October 1974 Armfield took the helm at Leeds United, replacing Brian Clough as manager, leading them to the European Cup Final in the 1974–75 season in which they lost 2–0 to Bayern Munich. Assisted by Don Howe, Armfield was responsible for rebuilding Don Revie's ageing but still formidable side, a task which he achieved with some success. Armfield bought in players such as Tony Currie and Brian Flynn, and under his stewardship Leeds never finished outside of the top ten, qualified for the UEFA Cup, and reached the semi-finals of the FA Cup in 1976–77 and the League Cup in 1977–78. Leeds was Armfield's final managerial role, and he decided to work in the media. He worked as a journalist with the Daily Express from 1979 to 1991. As of 2014 he is arguably best known as a match summariser for BBC Radio Five Live. 2009 marked his 30th year on the BBC. To mark the occasion, Armfield picked his personal Top 5 Players from each decade he had been summarising and these were broadcast as part of the 2009 FA Cup build-up on 30 May 2009. He also works as a consultant with the Football Association and in this role was responsible for the appointment of Terry Venables as England coach in 1994 and was also a key figure in Glenn Hoddle's appointment two years later. In 2000 he was awarded an OBE for services to football and in 2004 he was appointed a Deputy Lieutenant of his home county of Lancashire. In 2005–2006 he served as High Sheriff of Lancashire. Although born in Denton, Armfield has lived mainly in Blackpool, moving there in a Second World War evacuation, and in 2003 he was awarded the freedom of the resort. In 2004 he released his autobiography, Right Back to the Beginning: The Autobiography, which a book review in The Times described as "Authoritative and engaging, but at the same time warm-hearted and kind, there is not a harsh word, and hardly a critical one, in it". On 23 September 2005 he received a civic reception in Blackpool just after his 70th birthday on 21 September when a tangerine flag was flown from the town hall for the day in his honour. On 11 May 2007, he announced on BBC Radio Lancashire that he had been undergoing chemotherapy treatment for non-Hodgkin lymphoma in his throat, and was being advised to rest by his doctors, but he remained positive about his future. On 22 September 2007, Armfield was the half-time guest at Blackpool's Championship home match against Colchester United. He received a standing ovation, and he thanked the Blackpool fans for their support, which, he said, helped him get through the recent dark days. On 2 March 2008, Armfield was awarded the Outstanding Contribution honour at the Football League Awards ceremony in London. On 18 September 2008 Armfield was awarded a place in the football Hall of Fame at the National Football Museum in Preston, joining fellow former Seasiders Stanley Matthews and Stan Mortensen in the list of Blackpool players selected. The panel which consisted of Bobby Charlton, Tom Finney and Mark Lawrenson opted to induct Armfield. He was presented with the honour by former England teammate, Jimmy Greaves at the National Football Museum Hall of Fame Night, held in London. On 27 April 2008, Armfield was awarded the PFA Merit Award at the 35th Annual Awards Dinner at London's Grosvenor Hotel. He received three standing ovations when he got up to accept the award. In July 2009 he was honoured by Tameside Council in Denton, where he was born, and the Denton and Audenshaw District Assembly presented him with a lifetime-achievement award. Armfield was appointed Commander of the Order of the British Empire (CBE) in the 2010 New Year's Honours list for services to the community in Lancashire. Armfield's son, John, also played football, albeit to a less successful level and became a teacher in Lancashire. In October 1980, he signed associated schoolboy forms with Manchester United, but never made a professional appearance before going on to play non-league football for Runcorn, Barrow and Workington. In May 2010, after Blackpool won promotion to the Premier League for the first time, Armfield—who attended the Championship play-off Final at Wembley—wrote a column for the Daily Mail. On 5 May 2012 Armfield planned to attend the FA Cup Final between Chelsea and Liverpool to present the trophy to the winning captain. The South Stand at Bloomfield Road, which was opened on 20 March 2010, is named the "Jimmy Armfield South Stand" with ARMFIELD spelled out in white seats amongst the tangerine majority. On 30 October 2009, Blackpool F.C. announced that a statue of Armfield was being commissioned by the Blackpool Supporters' Association. The statue, nine-feet in height, would cost £100,000, with the money to be raised by a series of fund-raising events. The aim was to unveil the statue, which is located outside the main entrance, behind the West Stand facing Seasiders Way, on his 75th birthday in September 2010; however, the statue was not unveiled until 1 May 2011, with Sir Trevor Brooking attending the unveiling. "I feel quite humble about it and I must be honest I will be very proud to see it as I am with the stand, as Blackpool is my team and my town. It is nice to think that anything I have done has been appreciated, all people like to think that." Armfield, Jimmy; Collomosse, Andrew (2 February 2004). Right Back to the Beginning: The Autobiography. Headline. ISBN 0-7553-1276-7. ↑ "Jimmy Armfield". England Football Online. 9 January 2012. Retrieved 15 February 2016. 1 2 3 4 "Football League honours Armfield". BBC Sport. 1 March 2008. Retrieved 2 March 2008. 1 2 3 4 Calley, Roy (20 October 1992). Blackpool: A Complete Record, 1887–1992. Breedon Books Publishing Co Ltd. ISBN 1-873626-07-X. 1 2 Culley, Jon (27 May 2007). "League One Play-Off Final: The rock of Blackpool". Independent on Sunday. Retrieved 31 October 2008. ↑ Singleton, Steve, ed. (2007). Legends: The great players of Blackpool FC (1 ed.). Blackpool: Blackpool Gazette. pp. 40–43. ISBN 978-1-84547-182-8. ↑ "World Cup 1966 winners honoured". BBC News. 10 June 2009. ↑ "Sport honoured across the board". BBC News. 16 June 2000. Retrieved 31 October 2008. ↑ "Soccer Sherrif hangs coat of arms". BBC North West. 27 May 2005. Retrieved 31 October 2008. ↑ "Local heroes get freedom honour". BBC North West. 9 April 2003. Retrieved 31 October 2008. 1 2 "Resort honours footballing legend". BBC North West. 23 September 2005. Retrieved 31 October 2008. ↑ Lovejoy, Joe (29 February 2004). "Book Review: Right Back To The Beginning by Jimmy Armfield". London: The Times. Retrieved 31 October 2008. ↑ "Armfield faces cancer treatment". BBC Sport. 11 May 2007. Retrieved 11 May 2007. ↑ "Jimmy's thanks to 'Pool fans". Blackpool Gazette. 22 September 2007. Retrieved 23 September 2007. ↑ "Lions legend Ian McGeechan knighted in New Year Honours". BBC News. 31 December 2009. Retrieved 31 December 2009. ↑ The London Gazette: (Supplement) no. 59282. p. 6. 31 December 2009. ↑ "Sons and Daughters". Bob and 1970–71 Footballers. 12 October 2007. Retrieved 13 December 2008. 1 2 "Legend Jimmy Armfield Honoured With A Statue". Blackpool F.C. 30 October 2009. Retrieved 30 October 2009. ↑ "The Statue: How the life size sculpture will be created". The Jimmy Armfield Statue Fund. 30 October 2009. Retrieved 30 October 2009. 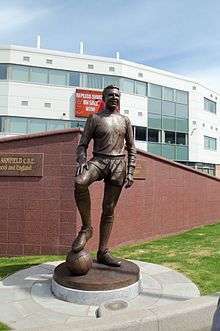 ↑ "Statue of Jimmy Armfield unveiled at Bloomfield Road". BBC News. British Broadcasting Corporation. 1 May 2011. Retrieved 1 May 2011.